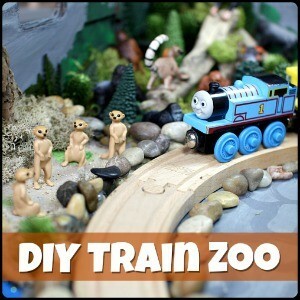 When I set about making a list of train books for summer reading, at first I was stumped. 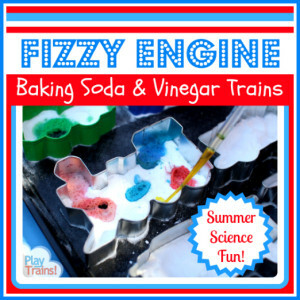 There are lots of books about trains set in the winter, but not so many that are really about summertime itself. 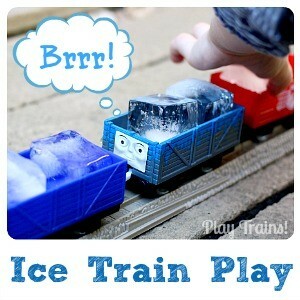 This is most likely because trains run in every season, in almost any weather. Outside of dealing with the snows of winter, to those of us who aren’t privileged to be riding in their cabs, there aren’t many noticeable changes in the way trains operate. But all around them, the change from one season to the next can be seen in the landscape trains run through, and the types of freight and passengers they pull. When I think of trains and summer, I think of journeys to the seaside, of the heat of the boiler of a steam engine compounded by the hot summer sun. 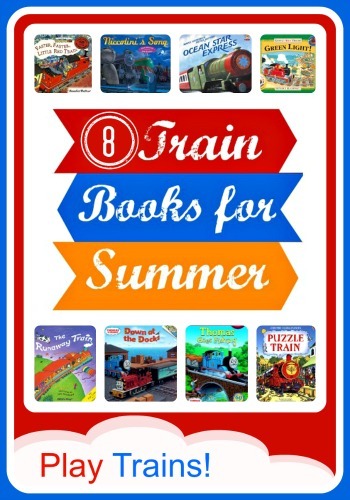 Those thoughts guided me in selecting some of our favorite train books we’ll be reading this summer. This post was originally published on May 30th, 2013. Several of the books are out of print or only available in the UK, and I’ve been very grateful to be able to easily order used and new copies of them for very reasonable prices on Amazon. I’ve included Amazon links; follow them and check out the “New from” and “Used from” columns in the price charts. By the way, if you click on one of those links, we will receive a small commission — at no additional cost to you — on anything you buy at Amazon for a certain length of time afterwards. I was otherwise uncompensated for this post. Read our disclosure policy for more details. 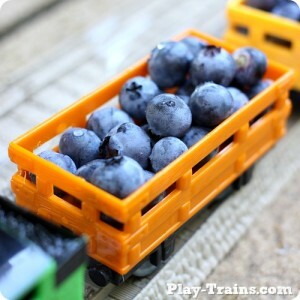 Ocean Star Express is a recent acquisition of ours, and it has become a fast favorite. Joe goes to the seaside on holiday with his parents, but all the fun disappears along with the sun when the weather turns dark and rainy. The owner of the hotel takes Joe up to see his magnificent model railway. 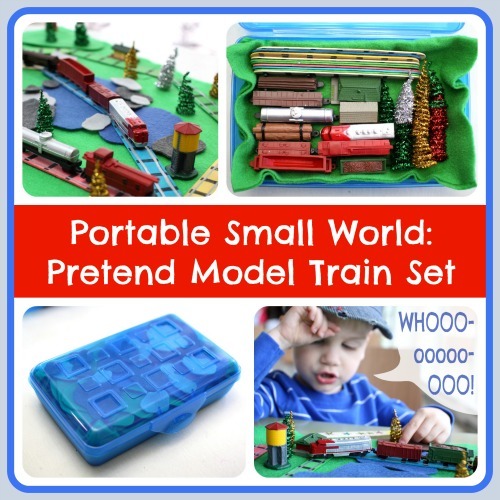 When he returns home, Joe finds the magic of the miniature around-the-world tour has enchanted his dreams, where he imagines himself riding the model train. This is a great book if you have a child who’s interested in model trains, and a lovely book to read at bedtime. Niccolini’s Song is another great bedtime book, and one of my favorite books to read to the Little Engineer. 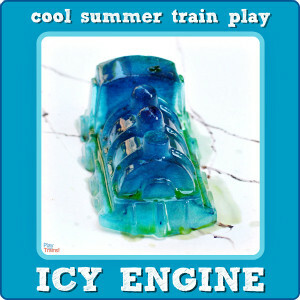 The hero of this story is a train yard watchman who is such a good listener, he can hear the worries of a steam engine. His lullabies first soothe sleepless steam engines, then a restless baby, and finally the entire town during a hot, windy summer night. The illustrations are beautiful and whimsical, and the trains are brought to life with the subtlest of anthropomorphic details. There’s even the opportunity to hum a melody here and there, if you like to add some musical theater to your bedtime stories. Down at the Docks features one of my favorite Thomas & Friends characters, Salty. A diesel engine with a sailor’s heart, Salty is invariably cheerful, kind and supportive. 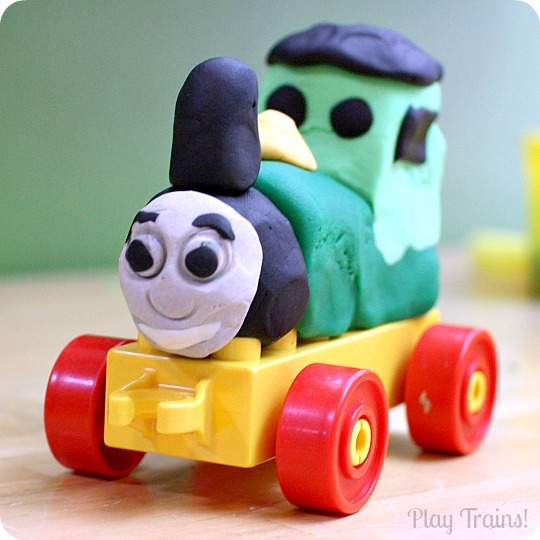 In the story, no one will let Thomas help, but Salty is encouraging, and in the end Thomas helps all the other engines. In addition to the seaside location, the presence of two aquarium cars adds to the summery atmosphere. Thomas Goes Fishing is a beginning reader’s book, but we enjoyed it when the Little Engineer was a toddler, so it works for different ages. Thomas sees children fishing, and he decides he would like to fish, too. This seems impossible until — through a twist of fate — he gets his chance. Fishing and a boiled-dry boiler definitely put me in mind of hot, summer weather while reading this book. The implausibility of the story is balanced out by the line, “I wish to fish,” which the Little Engineer finds hilarious. Green Light for the Little Red Train is a fun book that takes the reader on a tour through Western Europe as Duffy Driver follows directions a little too faithfully. Charged to keep going as long as the signals are green, he steams on through the Chunnel to France, then Spain, Italy, Switzerland, and onto a train ferry to get back home again. Somehow, he never realizes he’s left the UK! The beautifully detailed illustrations of sun-soaked southern Europe and the boiler going dry evoke summer quite well. Faster, Faster Little Red Train, another book in the same series, finds Duffy Driver taking over for a broken down engine pulling passengers to Pebblecombe fair, none of whom want to be late. 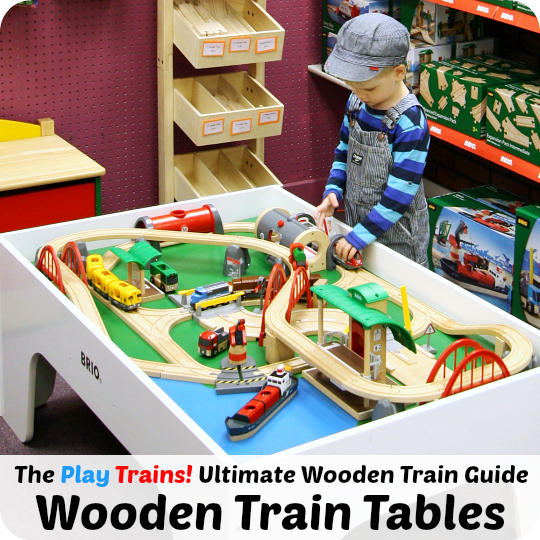 The Little Red Train speeds through the countryside, stopping to pick up more passengers and trying to make up time. The festive atmosphere and the arrival at the fairgrounds by the sea will be familiar to children who attend fairs and festivals over the summer. The Runaway Train is a fun, interactive book with a felt train on a ribbon that travels from scene to scene in the book through holes in the pages. The train takes a magical journey through many landscapes, flying through the air at some points, shrinking down to the size of a bug in others, before finally ending up at the seaside. The Little Engineer especially likes pretending the train is making a “sand train” at the end of the book. 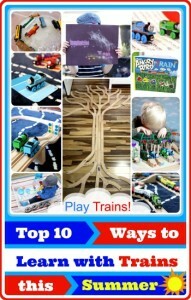 Puzzle Train is a wonderful book full of puzzles for children to solve. They do so alongside Alex, a boy who wants to drive trains when he grows up, as he helps Puzzle Train get its passengers to the seaside. 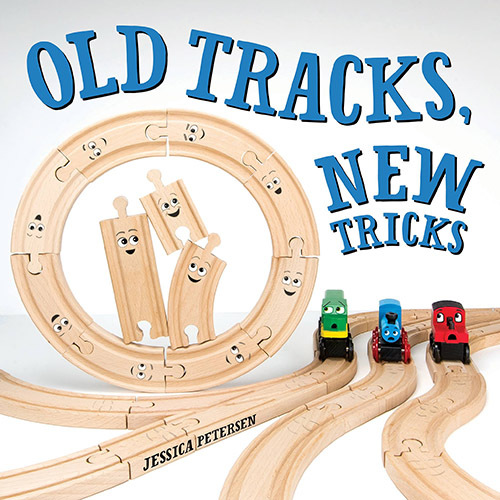 The Little Engineer loves this book, and came up with our Puzzle Train Ticket Mixup activity all on his own to play it out. Have a look at that post to read more about the book! But wait! I forgot a book last year! Instead of eight train books for summer, I meant to write about nine: Tracks by David Galef is perfect for summertime. The story begins when the engineer in charge of building a new railway line breaks his glasses when they slip off his nose on a hot, sweaty summer day. Also, most of the Peter’s Railway books take place during Peter’s summer holidays. 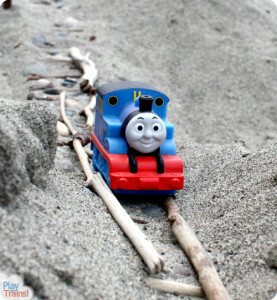 You can an in depth review of the series that accompanies Sand Tracks: a Train Beach Activity. 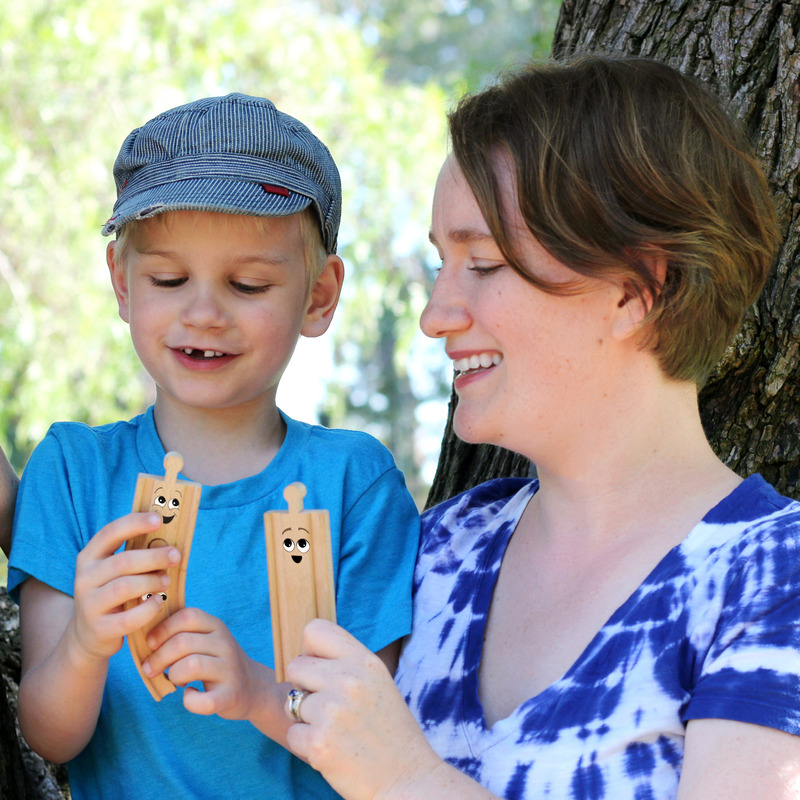 I hope you’ve found a few titles to add to your little engineer’s summer reading list! 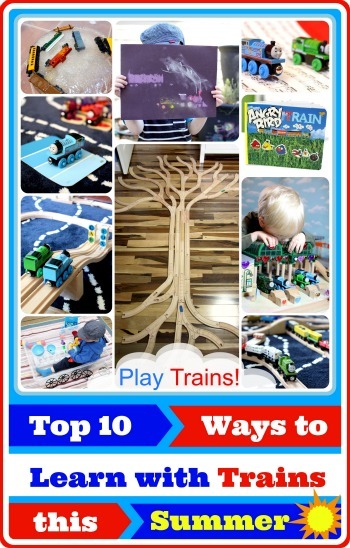 Now that you have some books to read, take a look at our Top 10 Ways to Learn with Trains this Summer list for some activity ideas to go along with the books. 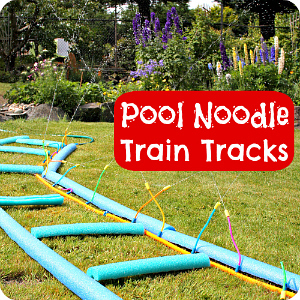 More Summer Fun with Trains! These are awesome, thank you! We have not read any of them, which is kind of blowing my mind a little. You’re welcome! I was shocked to find several train books we’d never heard of earlier this year, though at this point I think we’re down to upcoming releases and out-of-print books from the 50s! Though we’ve collected most of the old train picture books, too. I’m sure I’ll find something more recent that I missed eventually. I’m so excited that I found your site! Plus, I started following you on Facebook. 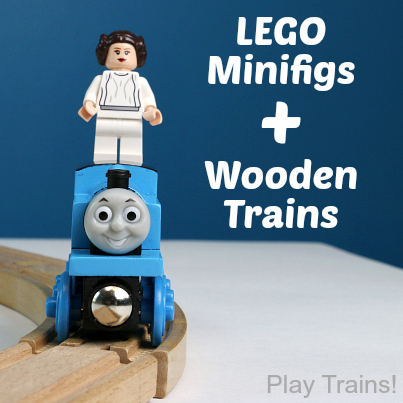 (Found you on Pinterest) My little guy is so addicted to trains too, so it will be nice to have someone share ideas! Thanks! 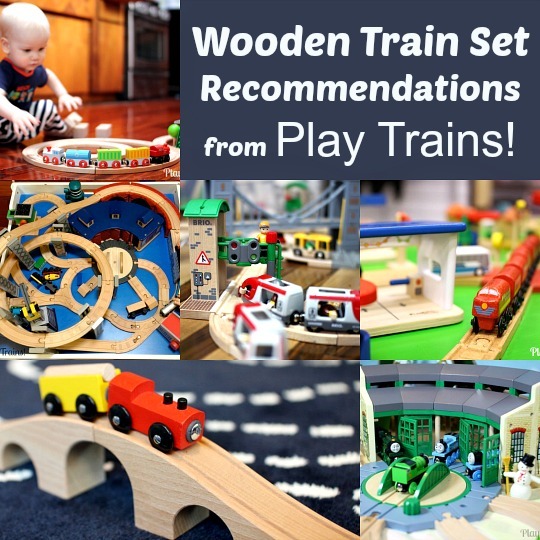 I love sharing train ideas…so glad you found us! Sorry about messing up my first comment! 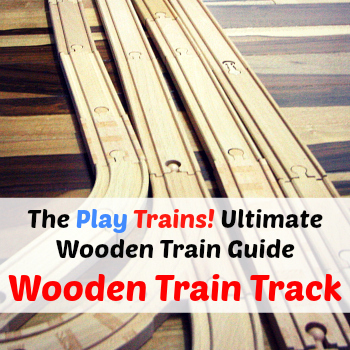 I don’t know how you come up with so many train-related books, games and activities, but I think it’s just great! Thanks for linking up with us today. No problem, Jackie. 🙂 It’s more that I don’t know how to stop coming up with train ideas! OMG train books I havent read a million times yet?!?!!? THANK YOU!!!! You’re welcome! I’ll try to get some more booklists up soon. I’ve found so many great ones! This is a fabulous list! I’ve loved amazon for finding books too! Thanks for sharing this at Teach Me Tuesday at Preschool Powol Packets! !